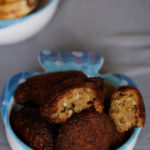 Gluten free Atta paniyaram recipe – paniyaram, vada, suzhiyam which is all included in Diwali recipes which we make these alone in the early morning on Diwali day. When the theme of healthy snacks comes for belly nirvana campaign in plattershare associated with place of origin, I thought to make something healthy and also helpful for the readers who are looking for Diwali recipes. Paniyaram is the best choice and I wonder how it turns out with gluten free Atta and granular jaggery they provided. Trust me it was amazing, the outer is crunchy because of the addition of rice flour and so moist inside. 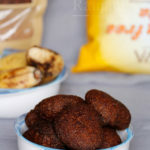 I just loved the banana flavor and spices in it.These gluten free snacks are good for all ages even its fried in oil that doesn’t matter.Enjoy this healthy snacks as unlimited :). You want to check more wheat recipes and Atta recipes. Here are the recipes for you. Scroll down to know how to make gluten free Atta paniyaram recipes with stepwise pictures. In a mixing bowl, add 1 cup of gluten free Atta, 1/8 cup of rice flour, ½ cup of Jaggery, ½ tsp of cooking soda, the generous pinch of salt, ½ tsp of cardamom powder, ¼ cup of shredded coconut. Mix everything well using fork or wire whisk. Then add ½ cup of mashed banana to it. Again mix well. Add water little by little and mix till reaches like idly batter consistency. Heat a wok to fry paniyaram, add oil as much needed. Once it gets heated, keep the flame on medium-low. Pour one ladle full of batter in oil, Refer picture .let it cook well, then flip to other side and cook. As we added Jaggery, so it turns a dark color. Cook well on low-medium flame. Otherwise, it won’t cook inside. Once it gets cooked, drain the oil and place it on a plate. Do the same with remaining batter and serve hot.